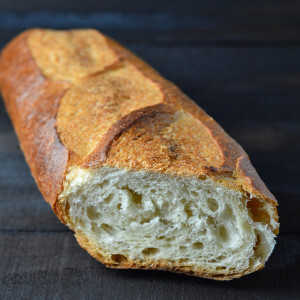 I started with some good day-old French bread. 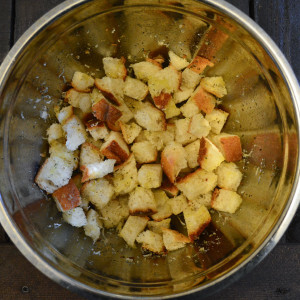 I used half a baguette to make crostini in a different recipe, and was left with the second half to make some nice, crunchy croutons. Use whatever bread you have on hand. Heels make great croutons, because really, who wants to use those to make sandwiches? Cut the bread into slices, and then into small cubes. 1/2 inch by 1/2 inch is a good place to start. 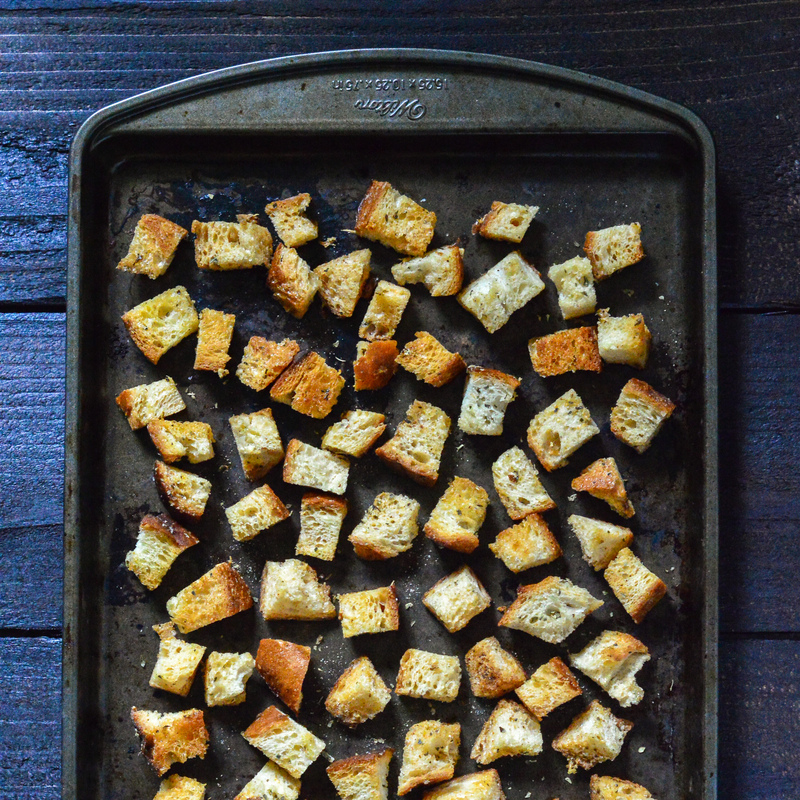 I like my croutons to be big enough to hold on to flavor. Whichever size you choose to cut them into, be sure they are relatively similar in size to prevent uneven baking. Add all the cut up cubes into a large mixing bowl. Drizzle with 1/4 cup olive oil, and stir gently to coat. Season with salt, freshly ground pepper, oregano, garlic powder, and a heaping tablespoon of grated Parmesan cheese (and I mean heaping). This part is totally customizable to your preference. Add in some cayenne and red pepper flakes for spice, or swap out the oregano for basil, thyme, or rosemary. 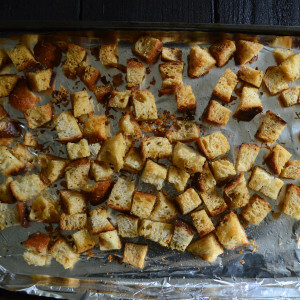 If you are pairing these croutons with a specific salad or entree, maybe use the flavors in that dish to tailor the seasonings. Prep a baking sheet by lining it with aluminum foil and lightly spraying with non stick spray. Spread the bread cubes into a single layer on the pan and bake at 350 for 15-20 minutes. Give the pan a good shake every 5 minutes or so while they’re cooking to prevent sticking and flip them around. 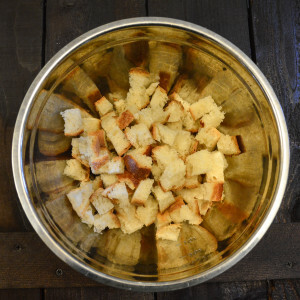 These croutons will keep for up to 2 weeks if stored at room temperature in an airtight container. 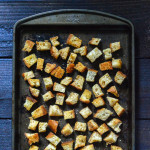 And you’ve been warned, once you see how easy these are to make, you’ll never settle for pre packaged croutons again! 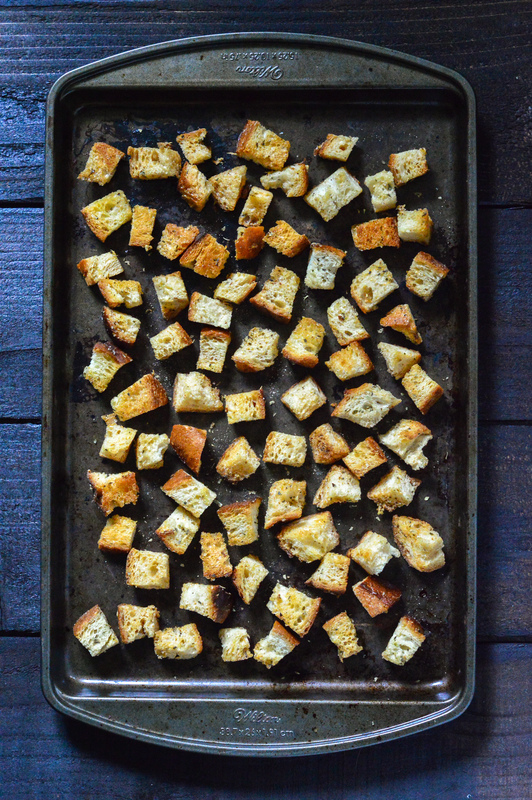 Quick and easy baked homemade croutons drizzled with olive oil, tossed with fresh seasonings, and baked until golden brown. Preheat oven to 350. 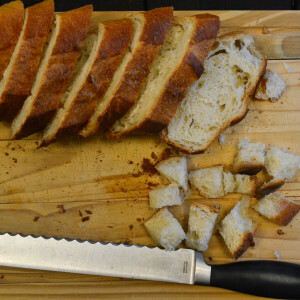 Slice bread into small cubes, ensuring that each piece is roughly the same size for even cooking. 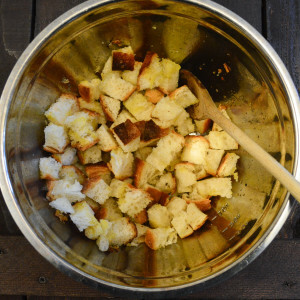 Place bread cubes in a large mixing bowl and toss with olive oil. 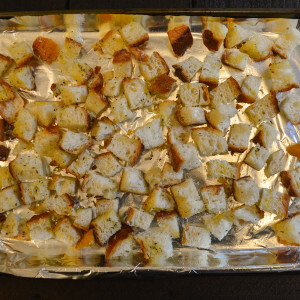 Add in salt, pepper, oregano, garlic powder, and Parmesan and gently toss to combine, coating each cube of bread. Line a baking sheet with aluminum foil lightly sprayed with non stick cooking spray. Spread bread cubes into a single layer on the baking sheet. Bake for 15-20 minutes, giving the pan a nice shake every 5 minutes or so. 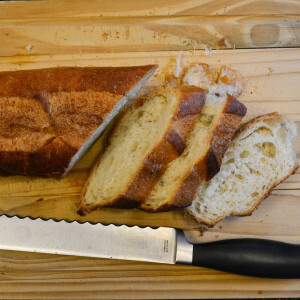 If your bread is too hard to slice, wrap the loaf in a damp paper towel and microwave for 20 seconds.